Orlando's most familiar landmark is undoubtedly the turreted Cinderella Castle that stands in the centre of the original Disney Florida theme park, the Magic Kingdom. Walt Disney World opened in 1971 and has been making dreams come true ever since. Today it is just one of four Disney parks that cover more than 28,000 acres of Orange and Osceola counties in central Florida, with accompanying resorts, shopping complexes, hotels, and waterparks. Apart from the Magic Kingdom, Disney World now includes the Epcot centre, Hollywood Studios, and Animal Kingdom. It also contains two water parks; Disney's Blizzard Beach and Disney's Typhoon Lagoon. 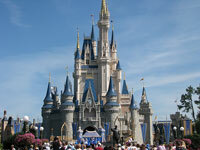 The Magic Kingdom is where the most famous Disney attractions are located. Little girls can visit the Bibbidi Bobbidi Boutique to receive princess makeovers, while boys can become ferocious swashbucklers at the Pirates League. Rides at the Magic Kingdom include classic favourites like Space Mountain, the Haunted Mansion, and It's a Small World. Disney's Hollywood Studios gives visitors a behind-the-scenes glimpse at the workings of the glitz and glamour of the movie industry, with rides and attractions dedicated to the Little Mermaid, Indiana Jones, Star Wars, the Twilight Zone, Pirates of the Caribbean, and even American Idol. Animal Kingdom is a wildlife park home to more than 1,700 animals from 250 species. Visitors can go on an Expedition to Everest, or a Kilimanjaro Safari, or through Avatar's Pandora. The iconic Tree of Life towers over conservation exhibits and dinosaur boneyards, with bird shows, thrilling rides, and live musicals.